Pregnancy pillows, also called maternity pillows, are a very specialized kind of orthopedic pillow. Over the nine months of a pregnancy, an expectant mother will experience many difficulties. On top of other changes—new vitamins to take, a modified diet to stick to, activities that need to be toned down, new clothes because old ones don’t fit—there is the very real problem of possibly not getting enough rest and sleep. Because a pregnant woman has to contend with the unfamiliarity of her body’s increasing weight and changing shape, bedtime can be an ordeal: a lot of aches, pains, and plain discomfort. How Is a Pregnancy Pillow Different from a Normal Pillow? As with any orthopedic pillow, proper support and placement of a pregnancy pillow or two while resting can encourage or maintain a better sleeping position; which can dramatically improve sleep quality and overall health. Side note: This also benefits anyone that happens to be sharing the bed with the mother-to-be; as tossing and turning will lessen, if not cease. Expectant partners, take this information to heart; but don’t just buy the first pregnancy pillow you see. Ideally, the person using the pillow should be the one making the choice—and if you keep reading, you’ll find out why. What Are the Different Kinds of Pregnancy Pillows? 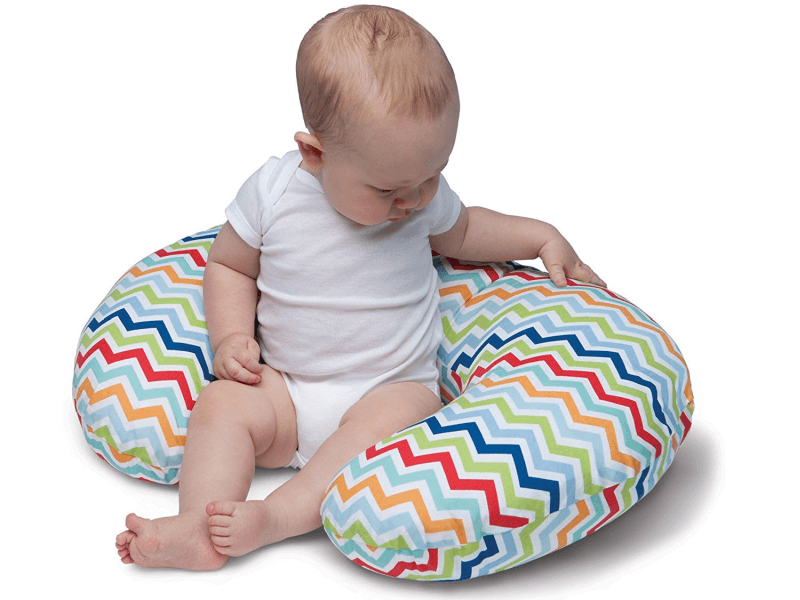 There are many different types of pregnancy pillows out in the market. Some address very specific issues, like back or hip strain; while some offer full body support or are said to be flexible with many uses. Some pregnancy pillows are even designed to be useful after the child is born—as a modified backrest or nursing pillow—or made to be comfortable and cozy for ordinary sleepers, too. It is essential to take everything into consideration—particular body aches, bed size, ideal budget, and more—when choosing the perfect pregnancy pillow. Below are some common variations you may want to consider. This is very often just a normal orthopedic wedge pillow that is marketed or named differently. Wedges come in a variety of shapes and sizes; there is no standard slope, and wedges have either rounded or angular sides. We have noticed that rounded sides, pictured above, are more popular in pregnancy wedge pillow variants. Perhaps this is because one of the most common uses of a wedge pillow by pregnant women is for tummy support, and no one wants to have a sharp, angular side sticking out and possibly interfering with a side sleeping position. Apart from this, the wedge pillow can support your back or head while in a sitting position; even propping up a heat pack or hot water bottle against your body. Laid flat underneath or replacing your head pillow, it provides gentle elevation to help with acid reflux or mild snoring. It can also placed between the knees or under feet for support and pressure relief. This type of pregnancy pillow is the smallest, most portable and the most affordable; with a multitude of uses during and beyond pregnancy. It takes up the least space on the bed, and is easy to move around, should you want to use it while sitting on a couch or while traveling in a car or plane. The downsides: You will often still need a head pillow, and you may need to try out more than one; some designs may have a slope that is either too gentle or too steep for your needs. Alternatives to the pregnancy wedge pillow are the nursing pillow, boomerang pillow, or tri-section pillow—which, when marketed for maternity use, are designed primarily to wrap around the mother’s body to support newborns during feeding. Of course, if you are having trouble finding a pregnancy wedge pillow that seems right for you, it’s not a bad idea to widen your search by looking at non-maternity wedge pillows before resorting to the more complex pillow types. Nursing pillows normally look like the letter U; boomerang pillows and tri-section pillows are named after their shapes. These pillow types can also function as a backrest and headrest for adults, and a bolster to prop up sleeping or sitting babies. Depending on a specific design, these pillows can also be used as a makeshift tummy or between-the-knees support for pregnant side sleepers—a very economical choice overall, if you happen to find on that comes in the size, shape and firmness that is perfect for you. Note, though, that some of the more expensive options we will discuss below are just as flexible when it comes to multiple usages; just not as easy to carry around and transfer from place to place. This is a catch-all term for an increasing variety of maternity-specific bolsters. The simplest kind is just the usual: long and straight. It is basically just an orthopedic body pillow that is meant to replace the usual two head pillows. Great for side sleeping and cuddling, you can wrap both arms and legs around orthopedic body pillows. However, what is provided is mostly comfort and not very much support or pressure relief. While it is true that some orthopedic body pillows are flexible and can be bent or molded into a shape that is more supportive, if this is what is needed you may be better off finding a full-length pregnancy pillow in the shape that you want in the first place. This type of pillow is also not ideal for active sleepers, as you may possibly roll away from it during the night. Still, there are upsides to getting this pillow over the sleeker, better-designed pregnancy pillows: It’s more affordable, pillowcases are easier to source or make on your own, and it’s likely not as bulky as other full-length pregnancy pillows. It’s still not easy to bring along if you’re traveling, but it’s probably the most portable body pillow type. A great compromise—the middle ground between a simple body pillow and a full-length pregnancy pillow—is the Boppy Slipcovered Pregnancy Body Pillow. There are two other main kinds of full-length pregnancy pillows; let’s call them the C-shape and the U-shape. Some pillows may look like they’re a J-shape, but often they are just a C or U with one end tapered or shortened so the product takes up less bed space. 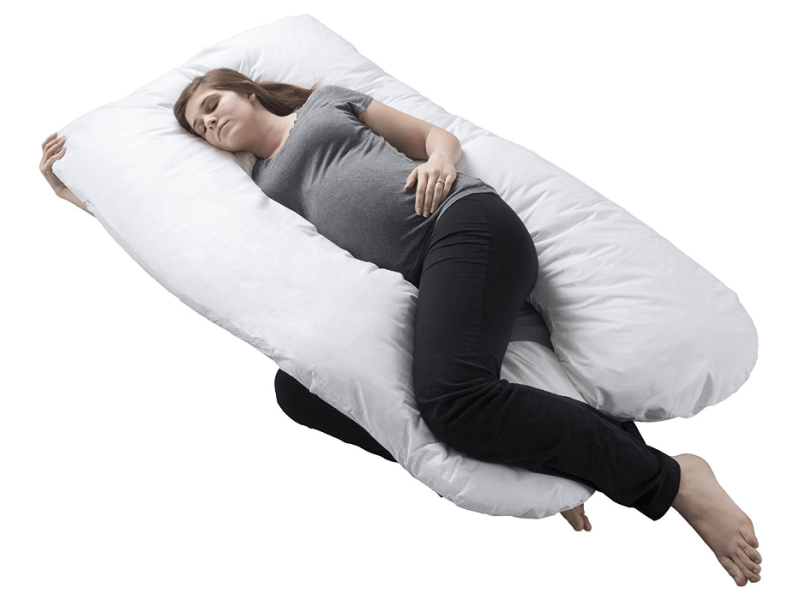 A full-length pregnancy pillow offers the comfort of an orthopedic boy pillow, plus superior support for multiple parts of the body. Below, we’ll look at C-shapes, U-shapes and some other notable and unique pillows. The C-shape full-length pregnancy pillow rests against your back, the top of the C cradling your head and neck and the base between your legs or knees—sometimes even curving up to support your tummy. The majority of the pillow is behind you for spinal and pelvic support, and also to prevent you from rolling onto your back; the latter helps particularly if you are an active sleeper and sleeping on your back creates aches and pains for you to deal with the next day. An extra perk to using a C-shape pillow is the way it allows for comfortable side sleeping without completely taking over the middle of the bed—that is, if you sleep facing inward, with your back to the edge of the mattress. It’s also a great pillow to use if you simply want to lie on your side and rest; because of the C-shape, it’s possible for you to be able to watch something or talk to someone with an unobstructed view. The Leachco Snoogle Total Body Pillow is a great example of a C-shape pregnancy pillow. 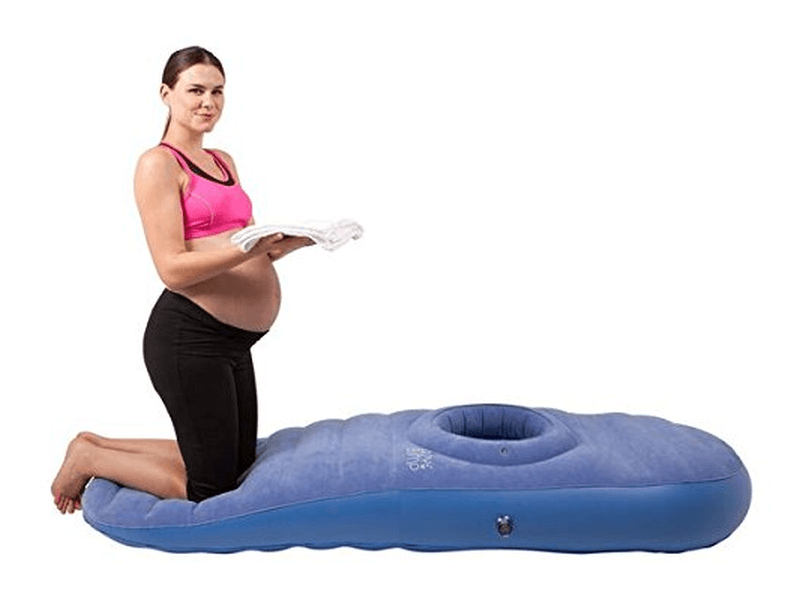 The U-shape full-length pregnancy pillow is even larger than the C-shape, but it does provide full support for the front and back parts of the body. To use a U-shape pillow, all you need to do it use one side like you would a normal body pillow. With your your arms and legs wrapped around one end, the other end will naturally run the length of your back and beyond, and the base of the U will cradle your head snugly. While a C-shape may be more useful when it is firmer, to offer more structural support, a U-shape may be better for some people if it’s a little less firm and more prone to conforming to the shape of your back. If you were a back sleeper before pregnancy made it difficult to sleep that way, using a U-shape could allow you to sleep in a simulated half back, half side sleeping position—just lean into the back end of pillow more. Like the C-shape, the U-shape offers spinal and pelvic support; and better pressure relief between the knees, as well as tummy support. However, a U-shape will take up most of your bed space! Even a queen-sized mattress may feel too crowded with you, your U-shape pillow, and your partner on it. It is also usually the most expensive kind of pregnancy pillow, barring some exceptions. Both the C-shape and U-shape can be used after pregnancy; their size and shape makes them very flexible and adaptable. You can use either as a nursing pillow, a reading pillow, or simply a comfortable orthopedic pillow. The length of these pillows, as well as their curvatures, make it very easy for them to be wrapped around your body or propped up in different ways. However the downsides are many, even without factoring in the usual price points: they are not portable and easy to store, you simply can’t bring them along while traveling, they are difficult to clean—dry cleaning may be the only option for most—and pillowcases often have to be bought from the same company, as there is no standard size and the curved shapes make it harder to make your own. What If You Were a Stomach Sleeper Before Pregnancy? You would think that there would be no options for this sleeping position, but there are more than a few; although most are recommended for naps and massages, and not for long hours of sleep. Most are also expensive; some are even marketed not to expectant mothers, but to massage therapists that may want to offer their services to pregnant clients. These pillows are designed for comfort, and have the added benefit of easing lower back pain and decompressing the spine; but if you can sleep soundly on your side or back, and can make do with other pregnancy pillows, do so. Even the best and most reputable pillows of this kind need to be approved by your personal physician before you use them. To use a pregnancy pillow designed for back sleeping, you will first need to find one that matches the dimensions of your body—most products come in several sizes. Some pillows are shaped to make room for both your chest and tummy; some only accommodate the stomach. Some have elaborate headrests, while some don’t have any at all. Whatever the case may be, it’s best if you choose a product that comes with a return policy. With the typical price points, making sure that you are paying for only what will truly help you is critical.